Our first stop on our trip to Hawaii was the island of Oahu. For us Australians, we don’t have many flight choices other than to land at Honolulu. This island was also to be our final destination as well. The flight from Sydney to Honolulu was a 10 hour red-eye, and thank goodness that the Pok (AKA my son) slept for a good portion of the trip. This also meant that he got into the Hawaiian islands timezone straight away. My parents were travelling with us as the raison d’être for the trip was my youngest brother’s wedding. They sat in the row behind us on the flight and it was great having another set of “babysitters”. I didn’t realise that this was also the first time that my father had been to the United States, so it was all going to be new for him. As we came into land, I was surprised at how high the lush green mountain ridge line looming on the Northern end of Honolulu was. We arrived at Hawaii! Oahu is probably the island I knew the most about, having seen many photos, TV shows, and movies all based around Honolulu and Waikiki. But my strangest familiarity was from the taxi ride to our hotel at the Western end of Waikiki. I was familiar with the roads, from a computer game of all things. Back in 2007 there was a game released for the original Playstation Portable called “Test Drive Unlimited”, which was set on the island of Oahu. Not only was this game set on the island, but it was accurate with the road layout gained from satellite map data coupled with the lane widths and intersections. It was a very weird sense of deja vu. We arrived early to our hotel on the first day and that gave us the opportunity to ease into Waikiki. Lunch at a bar on Waikiki which had all of its doors and windows gloriously open to the outdoors would set the tone for the next two and a half weeks. And there were gardens EVERYWHERE, with flowers of all kinds in bloom. This got my son quite excited as he had been looking forward to seeing a “hula hibiscus” that Minnie Mouse searches for in an episode of the Mickey Mouse Clubhouse (if you are a parent of a two year old you will understand). The first place that we stayed at was the Ilikai Hotel and Suites, which is where the opening scenes to the original Hawaii Five-O were filmed – you know the one where the camera zooms into Jack Lord standing on the balcony. You can hire that suite if you want, but it will cost you. Unfortunately Jack Lord was nowhere to be seen. It is an old hotel by the rest of the Waikiki residential standards, but a good portion of the suites have been updated to modern standards so we were quite happy with where we stayed. 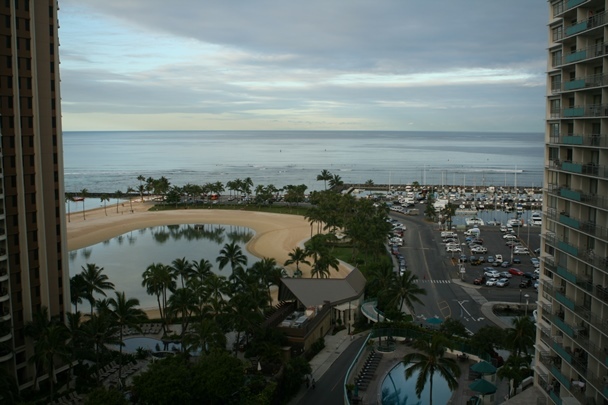 It is located on the Western side of the Waikiki beach strip, but a great location for anyone with families as there is a very large lagoon within a quick walk out the back of the hotel that is safe for children to safely swim in without any fear of being wiped out by a wave. From here you are also within walking distance to many of the shops and restaurants including the Ala Moana shopping mall. Below was the view from our balcony at around half an hour after sunset. Our first night in Oahu was to be spent with an old work colleague Shannon from Sydney (well originally she is from New Zealand), who met the man of her dreams Dave who is in the US Army and has been posted in Hawaii for a few years now. They were set to depart on return to the mainland in a couple of days for Dave’s next posting. Shannon and Dave to my wife and I on a drive to the South Western side of the island near Ko Olina to watch the sun set over the ocean and grab a great bite to eat. We had a fun night telling stories and talking about old adventures. Dave gave us plenty of tips for our trip, and provided me with more items to add to the travel bucket list – more for next time. For Shannon, the move was going to be a big change but she was looking forward to it with optimism and happiness. Thanks guys for the wonderful night out and hopefully we will catch up with you again in the future on the mainland. While at Waikiki, I told my wife that I had to try my hand at a long board and hit the surf. I woke up early one of the morning and headed out to the beach. There were already a load of surfers out past the break. This was to be the second time I had tried my hand at surfing, but I have had years of experience on a body board in the Sydney surf. But I didn’t realise how out of practice my paddling muscles were. I picked up a 10 foot board and paddled out through the break. A big board is a big piece to get moving, and I underestimated how much energy I would need to catch the waves. 30 minutes into my 1 hour hire I was totally shattered. I had caught onto three waves by that stage, but hadn’t stood up. The first time I stood up, I wobbled and then proceeded to fall backwards into the water. The second time I stood up I was too far back and lasted maybe 5 seconds before falling off the back of the board, while it continued in the broken surf for another 25m or so. The third time I nailed it! I got up and was planted and it was AWESOME! I rode the wave for maybe 15 seconds before the wave petered out and I dived off the board. I managed to catch one more wave but my energy was totally sapped. Seven waves in all in a 1 – 2 foot swell. I was chuffed but totally exhausted. When a couple of the locals saw me walking back in my board shorts they nodded the greetings of the morning, all I could return back was the shaka sign and a big grin. It may not be the best beach in the world, but it is certainly one of the most famous. And it has got a lot going for it with surf, snorkeling, dining, and shops all nearby. We spent a few days laid out on the beach soaking up the sun and a couple of nights eating by beach side. The second place we stayed at was the Outrigger Reef Hotel and it has a great restaurant, the Shore Bird Restaurant & Beach Bar, located right on the beach with views to Diamond Head. You get to cook your own steak and feast on an assortment of buffet goodies. I had an interesting experience where a couple of drunk (more like hammered) freeloading girls tried to waltz up to the grill and steal my steak and ribs – to which the restaurant staff quickly evicted them. With the Diamond Head volcano in the distance and great sunset views, it is hard not to like Waikiki. It is easy to be a holiday maker here. And our boy loved digging up big holes in the beach for him to jump into and request to be buried. This resulted in sand getting into him everywhere, which is an interesting experience when cleaning up your child. He discovered a discarded yellow spade that would end up coming with us on the rest of the trip. When I explained to him that Diamond Head was a volcano, he was a bit confused. This would come in handy later in the trip for when he played up and I would threaten to throw him into the volcano. This is still working for the moment. If you are lucky, you might chance an impromptu hula show encouraging you to attend the many Luaus that are present at the hotels and resorts. My son was giddy with excitement when he saw the performers dancing and proceeded to shake his hips. He was having a good time already, and nothing makes me happier than seeing him happy. 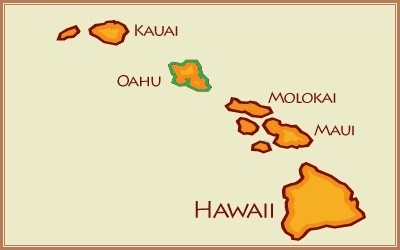 Honolulu was the base for us to journey to Pearl Harbor, but that is for the following post. For now, I am going to keep unpacking the bags and get settled back into normal life. Missing Hawaii already, but in Honolulu I got the chance to knock off two of my travel bucket list items for the trip.